Seth A. Johnston. How NATO Adapts: Strategy and Organization in the Atlantic Alliance Since 1950. Baltimore: Johns Hopkins University Press, 2017. ISBN: 9781421421988 (paperback, $29.95). Starting from the premise that institutions are inherently resistant to change, Johnston goes on to develop a framework for thinking about institutional adaptation that focuses on the power relations between actors. He identifies seven specific processes or mechanisms of change through which international actors may act to facilitate their own adaptation: convening, agenda-setting, delegating, information-sharing, delaying, moderating, and co-opting. Many of NATO’s key adaptations over the years were the result of political figures, often the secretaries-general, deftly wielding these tools. In choosing to tackle both the internal and external dimensions of institutional adaptation through analyses of changes in NATO’s organization and strategy from its founding to the present, Johnston has written a book whose scope is impressively ambitious. Though he does a good job in discussing both dimensions, this reader was left wishing he had said more about the interplay between the two. Does organizational adaptation necessarily demand strategic adaptation, or vice versa? Or can the processes unfold independently of each other? The core of the book is comprised of three case studies of NATO’s institutional endurance from the 1950s, 1960s, and 1990s. In selecting the cases for study, Johnston adopts the ‘critical juncture’ approach that is popular in much historical institutionalist work. While noting that the association between critical junctures and institutional/strategic adaptation is not perfectly linear, Johnston does not follow up on this important insight by discussing cases of institutional stability following critical junctures, or “choice points” (3, 5-7). Instead, each of the cases examined eventually led to institutional change. Treating institutional change as a dichotomous variable glosses over much that is theoretically interesting about how organizations like NATO adapt. Even so, Johnston’s account has significant empirical merits, especially when stressing the contingency involved in each case and the non-NATO institutional alternatives that were possible. Johnston’s first case study traces the effect the Korean War had on early NATO adaptation. By disrupting the alliance’s otherwise “leisurely, path-dependent approach to its organizational development and strategy,” Johnston writes, the conflict loosened the structural constraints on action necessary for addressing the German question. (45) Coming as it did so soon after NATO’s founding in 1949, the North Korean invasion in June 1950 was an important critical juncture in the Alliance’s history. The conflict dispelled the early optimism still shared by many at the time that the global ideational and power struggle than materializing between Moscow and Washington could remain ‘cold.’ European states-still in the early stages of their post-World War II recovery – were especially quick to grasp the significance of a war arising over a divided Korea, as well as the implications it might have for Germany’s own divided status, closer to home. Thus, NATO’s survival was by no means a foregone conclusion, Johnston argues. After all, this was the era of West German Chancellor Konrad Adenauer and French diplomats like Jean Monnet and Robert Schuman. The integrationist spirt in Europe was running high. Though Johnston is right to highlight the alternative European projects taking shape at this time–such as the signing of the treaty for the European Defence Community (EDC) in May 1952–his argument that these intra-European endeavors represented a “potential institutional alternative” to NATO in the wake of the critical juncture of the Korean War may be overstating things (39, 70). Given the imperative of keeping the Americans involved in continental defense in the early 1950s, it is difficult to imagine an institutional alternative that was not backed by the Americans replacing one that had their full support. This was the early Cold War; a time when Europe was entirely dependent on the United States for its defense. And the United States was a member of NATO. Solutions to the challenges of the day would therefore have to be found not by building new organizations, but by working within existing ones. Ultimately, of course, this is what happened, with the EDC passed over in favor of NATO. 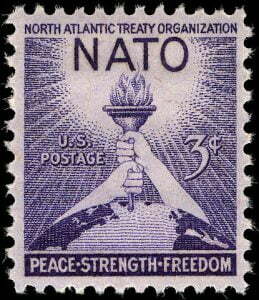 The price for keeping the Americans ‘in,’ was West German rearmament, and eventually, membership in NATO. Thus, the Alliance adapted to the challenges of the early 1950s by creating formal apparatuses like a peacetime integrated international military force, a committee of military representatives, and other sub-organizations, in effect, putting the ‘O’ in NATO. One interesting thought experiment to consider is whether NATO would have undertaken these institutional changes absent the war in Korea. The answer is almost certainly yes. The timing of these adaptations might have differed slightly but the German question still needed resolving in the 1950s. Johnston’s second case study looks at the role the twin shocks of the Second Berlin Crisis and the 1962 Cuban Missile Crisis played in debates about extended deterrence in the early 1960s. A third event, the withdrawal of France from NATO’s integrated military structure in 1966, was the catalyst for important adaptations in NATO’s organizational structure, like the Nuclear Planning Group (NPG). Johnston argues that just as the Korean War led NATO to transform itself from a traditional alliance into a highly institutionalized international military organization, the Berlin and Cuban crises led to a broadening of NATO’s remit to include the active promotion of peace and détente. One question that arises from this chapter is what counts as a critical juncture for NATO. “The history of the Atlantic Alliance,” as Stanley Hoffmann famously noted, “is a history of crises.” A key task for alliance scholars therefore is distinguishing between what Hoffmann called the “routine difficulties” arising from the inevitable divergence of interests and the “major breakdowns” owing to different world views. As such, Johnston’s decision to treat the Berlin and Cuba crises, but not the creation of the Warsaw Pact in 1955 (and the launch of Sputnik two years later) or the Suez Crisis of 1956, as critical junctures deserves greater examination than it receives. While acknowledging the crisis credentials of both the Suez War and Sputnik launch (but oddly, not the creation of the Warsaw Pact,) Johnston concludes that neither event sufficiently relaxed the structural constraints on action in NATO that was necessary for adaptation to occur. However, as Louise Richardson and others have argued, the Suez War–in addition to representing a major schism in Anglo-American relations–threatened the NATO Alliance. For Johnston, though, the war fails to cross the thresholds of momentousness and contingency necessary for a critical juncture. If this is so, then more should be said about why, as well as the criteria for meeting these thresholds in general. The latter is particularly important if we wish to identify future potential critical junctures for NATO ex ante, rather than merely post hoc. Nevertheless, the chapter’s discussion of European nuclear schemes from this period, such as NATO’s Multilateral Force (MLF), is particularly strong. Scholars working on extended deterrence in East Asia might also find the period covered here, as well as Johnston’s wider discussion on European reactions to fears of American de-coupling, useful. Johnston’s third case study examines the institutional alternatives available to NATO in the immediate post-Cold War era as well as the organization’s strategic adaptation in the 1990s. According to Johnston, the end of the Cold War posed four interrelated challenges for Brussels: (1) the resurgence of the German question; (2) collapse of Soviet authority in Eastern Europe; (3) the legacy of Russian power; and (4) NATO’s role in the ‘new world order.’ The scope of these challenges helps explain why, unlike with previous critical junctures in NATO’s history, various institutional efforts (as opposed to a single institution) for dealing with the post-Cold War European security environment appeared possible in the 1990s, such as the Organization for Security and Cooperation in Europe (OSCE), the European Union, and the United Nations (UN). Of the three alternatives, Johnston argues that European integration was the most viable. NATO’s reaction to the end of the Cold War also differed from other critical junctures in that it initially responded by subordinating its activities to others in places like Yugoslavia by relying on the Conference on Security and Cooperation in Europe (CSCE) and UN to stop the violence in Bosnia. A fourth and final empirical chapter considers the applicability of the argument to contemporary challenges like Kosovo and the terrorist attacks of September 11, 2001. Whereas Cold War challenges to NATO undermined the institution’s credibility, and the immediate post-Cold War environment undermined the institution’s relevance, Johnston suggests the challenges of the twenty-first century are likely to undermine both. His decision to include cases from both the Cold War and post-Cold War history of the Alliance in the study is commendable given the tendency of many NATO scholars to focus on one or the other. Johnston’s ability to connect the argument to both periods as well as his skill at historical narrative represents one of the major strengths of the work. In sum, How NATO Adapts has much to recommend it, both to long-time NATO followers as well as newer students. Written before the tumultuous political events of 2016, the book also provides a rare moment of optimism: NATO has weathered rough seas before, in each case surviving by adapting. In the present climate of geopolitical uncertainty, versatility in one of the main pillars of the post-war order is worth celebrating. Sara Bjerg Moller is an Assistant Professor of International Security at the School of Diplomacy and International Relations at Seton Hall University and a Non-Resident Fellow at the Modern War Institute at West Point. For the 2017-2018 academic year, she is also a Stanton Nuclear Security Junior Faculty Fellow in the Security Studies Program (SSP) at MIT. The views expressed herein are those of the author and not necessarily those of West Point, the Department of the Army, the Department of Defense, or any agency of the US government. Wallace J. Thies, for example, looks at the internal makeup of member-states and what he calls the “hidden strengths” of an alliance of democracies to explain the organization’s staying power. Wallace J. Thies, Why NATO Endures (Cambridge: Cambridge University Press, 2009), ix. In May 1950, only a month before the North Korean invasion, European leaders had proposed that the coal and steel industries of France and Germany be placed under a supranational authority, in what would come to be known as the Schuman Declaration. Helga Haftendorn argues by contrast that the French withdrawal was a symptom, not the cause of the crisis over the credibility of extended nuclear deterrence. Helga Haftendorn, NATO and the Nuclear Revolution: A Crisis of Credibility, 1966-1967 (Oxford: Clarendon Press, 1996), 5. Stanley Hoffmann. “NATO and Nuclear Weapons: Reasons and Unreason,” Foreign Affairs 60:2 (1981), 327. Wallace J. Thies made a similar observation, describing “the propensity of participants and observers alike to proclaim [NATO] ‘in crisis’” as a constant in Alliance scholarship. Thies, Why NATO Endures, ix. The war diverted attention (and British and French military supplies) away from the central focus of the alliance, the northern flank, undermining NATO’s credibility in the process. Pentagon officials also worried the U.S. might need to rescue Britain if it looked like London appeared in danger of losing. Louise Richardson. When Allies Differ: Anglo-American Relations during the Suez and Falklands Crises (New York: St. Martin’s Press, 1996), 123-124. Ralph Dietl argues Suez arose out of dissatisfaction with the existing Western bloc architecture and was part of a larger European integrationist struggle against the existing bipolar global order. Ralph Dietl. “Suez 1956: A European Intervention?” Journal of Contemporary History 43:2 (2008): 259-278. On Suez as a NATO crisis, also see: Thies, Why NATO Endures, 205-207.